Idle Army Tycoon is a unique army hero RPG simulator developed by Sablo Blocky World. You will earn coins and then unlock forces commando and will do country attack. Unlock all countries as encounter tycoon and boost your idle economy in millions, billions, quintillions and octodecillions. Fight endless and defend your country after hiring the army manger. Defeat world distinct kingdoms army mission and explores idle army tycoon power promote army weapons, solider, and attack worldwide. Become a rich business capitalist and go to more money making adventure in power industries idle clicker incremental game. If you get stuck in the game, check out the video walkthrough and gameplay for the game. 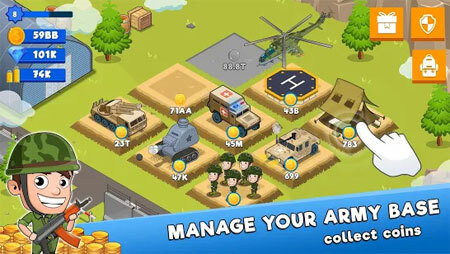 This entry was posted in Android Games, Mobile Games, Walkthrough and tagged Idle Army Tycoon Cheats, Idle Army Tycoon Gameplay, Idle Army Tycoon Guide, Idle Army Tycoon Strategy, Idle Army Tycoon Walkthrough by Marvin. Bookmark the permalink.